What's up, people of the world? It's Wednesday and so you know what that means...! Oh wait, maybe you don't, right. Well, it means new comic book day and I, Eric Stirpe, am here to review more comics! This was a pretty good week with 4 really good Marvel titles and a pair of decent DC books. Not bad. Let's just jump right in, shall we? So this is officially becoming a very interesting book now. After spending the first two issues on the set-up of "Put the original X-Men in the present" we suddenly switch gears entirely to seeing what Cyclops and Magneto are up to; once mortal enemies, these two have now become allies and, possibly, even friends. Very cool and tragic to see Cyclops going down the path of becoming a true mutant terrorist; blaming his actions on madness, on the Phoenix Force... All while Magneto cautions him, saying that he once did the same thing, and look how he turned out. Cyclops says the he's doing all this for the mutants of the world, but it's definitely starting to look muddled, and I'm excited to see how this plays out; will Scott really end up going down a path that leads him to becoming the next big supervillain? If I had one complaint with this it was that the pacing was maybe a bit too slow this month; felt a little 'filler-ish.' 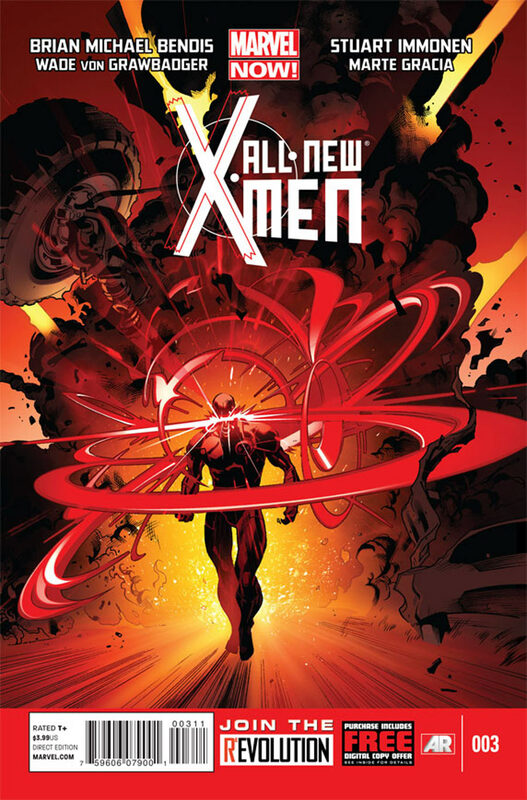 But that aside the art was great and the writing continues to be incredibly solid - The way Bendis writes both Magneto and Cyclops is awesome, and I can't wait to see what happens when young Magneto-hating Cyclops meets his older Magneto-allied counterpart... If it keeps up like this, then this book is shaping up to be one of my anticipated titles each month. Oh Amazing Spider-Man - This book continues to be the title that gets me going into the comic shop as early as possible on Wednesdays before anything gets spoiled for me on the internet. Dan Slott's writing on this continues to be just plain killer. In a nutshell, Doc Ock (dying of horrible diseases inflicted by his years of mad scientisting) somehow managed to switch bodies with Peter Parker somewhere along the line, trapping Peter in Ock's dying body. That reveal in #698 was freakin' shocking and exquisitely well-done, especially since the implication was that it had happened weeks and weeks ago... Well, in this issue Mr. Slott turned over all the cards, as he says, and revealed what had been happening. Basically it was a crazy and convoluted plot going back a whopping 98 issues to ASM #600 involving mind-controlled octobots which kept showing up and slowly rewriting Peter's brain until, finally, Ock could make the switch... sure enough, go back through the past 98 issues and those damn little octobots did keep showing up. Fantastic. And now we switch gears to DC Comics with Animal Man. One of the creepier titles out there right now, Animal Man and Swamp Thing are currently intertwined on a big story called "Rotworld" where both of them are in an alternate future fighting to free the world from Anton Arcane, master of The Rot. It's a cool enough story, but damn can it be a downer. DC's story-telling style has definitely had an emphasis on the drama lately, with slower pacing, lots of dialogue, and a lot of characters standing around planning things and arguing... I guess it's just hard to take the Rotworld story seriously when the rest of the DC Comics universe is completely unaffected by it. Meanwhile, over in the Green Lantern books there's another crossover story supposedly about the end of the world called The Third Army and another happening with Aquaman called Throne of Atlantis and another in the Batman books with the return of the Joker. They're just in the middle of major crossover mega-story arc glut right now and I'm kind of tired of it. Ahh Deadpool. You might as well be the anti-thesis of DC's drama-heavy dreariness right now. Co-written by comedy greats Brian Posehn and Gerry Duggan, this one came out of the box swinging and continues to be great. An evil overly-patriotic sorcerer has brought all the presidents back from the dead; unfortunately they came back sans-humanity and are now evil and trying to take over the world. It would look bad if a high-profile hero like Captain America or Spider-Man were in the newspaper killing zombie presidents, so Deadpool has been chosen by SHIELD to track down and kill them all. 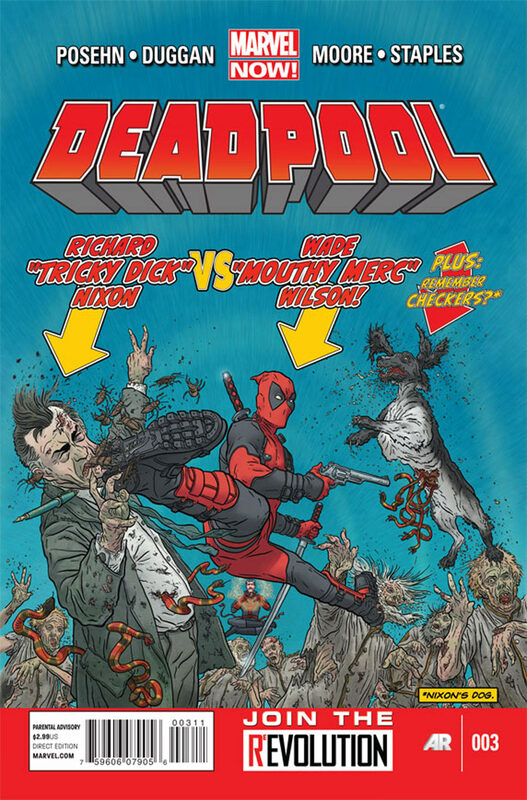 What has emerged from that fantastic weird premise is a hilarious adventure as Deadpool picks up a posse (including the ghost of Ben Franklin) to go and re-kill all of the presidents. 3 issues in so far and the writing has been really funny, the art is great and the overall pacing has been splendid - Just enough happens to make it feel worth my money, but not so much that it feels overwhelming. They're writing this like a well-done action/comedy TV show or something like that. I'm loving this title and I can't wait to keep putting more of it in my faceholes. Okay, talk about a surprise! I started picking up Hawkeye with issue #2 of this new volume not knowing at all what to expect; I just thought the sparse art style was cool-looking. To my surprise, this book has been hilarious, original, and just oozing with personality. Matt Fraction, the writer, sets up Hawkeye as sort of a loser of the Marvel universe; an Avengers member, yes, but also continually suffering from bad luck and trying to keep ahead of life. It's a great interpretation of the character and, with his supporting cast and inner monologue, has made this a really charming and fun book. The way sound effects and narration are handled in this is great too. For example, when Hawkeye gets smashed in the head and is then trying to understand what someone is saying the word balloon reads simply "Vague noise that I'm pretty sure is talking." It's the kind of thing you could only pull off in a comic book and Matt Fraction does it really super well. Over all, loving this one. One of my best surprises of 2012. 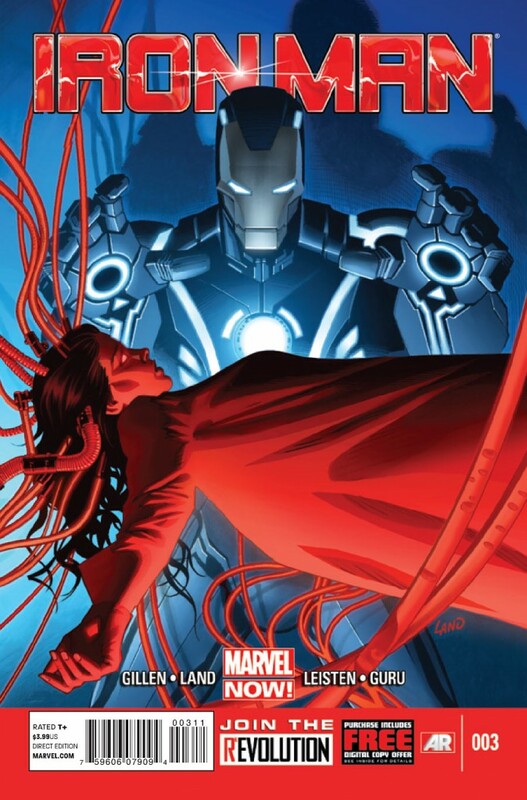 Along the way, though, the writing has had a great emotional core, with Tony trying to figure out his role in life and as a hero, and it seems like there's a slow emotional arc that they're going to be exploring. These first 3 issues have had the feeling of setting up pieces for something bigger and I'm really excited to see where it goes. A direct tie-in with Animal Man, Swamp Thing is also entrenched in the Rotworld story arc. Sigh. I really wish I cared more about this but I just don't. There's a huge, overly complicated story going on here and about 75% of this comic focused on exploring the tangled backstory and soap opera drama of Swamp Thing's past, the Arcane family, etc. etc. etc.... The one cool thing was the reveal that Swamp Thing had to go to the Rotworld-destroyed Gotham City, with the promise of seeing Batman being a badass fighting the Rot or something. It's a sad trend that I keep buying DC titles and they keep disappointing me. I guess I just don't care about the drama that they're trying to do. It's all drama built out of huge "world threatening" dangers that feel so wooden and forced. I compare it to the drama of Amazing Spider-Man or Iron Man or All-New X-Men, all of which are completely character-driven, and those feel so much more exciting and meaningful to me. Seeing the endless "world-threatening" adventures of the DC Universe has been... tiring. Maybe it's just that I'm seeing that the way DC handles its stable of characters is a lot flatter than Marvel's current method. Anyway. I don't want to rag on Swamp Thing too directly here. The writing is serviceable, the art is good. It's just too bad that I don't feel invested at all. So that's this week! 5 terrific Marvel titles and 2 mediocre-to-sub-par DC titles. If this trend keeps up, when 2013 rolls around my Marvel pulls will be outnumbering my DC pulls by quite a bit... DC is just trying so hard to build a "unified serious tone" for all of their comics that it makes them all feel far too dramatic and burdened by emotional gravitas, whereas Marvel has been firing all over the place: Some of their books are really funny, some are really serious, some are spy dramas, some are thrillers... It's a lot more risks, but it also feels like it's paying off a lot more.